These days, oscillating multitools are among the hottest items at the hardware store—not that they’re exactly new to the market. In fact, Fein Power Tools Inc. had cornered the oscillating multitool market for nearly 25 years before the company’s patent expired in 2009, opening a window for major tool manufacturers to swoop in and introduce competitive multitools of their own. The dictionary defines oscillate as a verb meaning “to swing back and forth with a steady, uninterrupted rhythm.” By utilizing high-speed oscillation rather than rotation or reciprocation, these versatile instruments can scrape, sand, plunge cut, flush cut and more, using a broad assortment of accessory blades. The oscillating action allows the user to perform either fine, detail work or to tackle more aggressive applications. The reason the clumsily named oscillating multitools have not been a workshop staple for the last couple of decades rests primarily on the price of the Fein unit. While still considered the “Cadillac” of oscillating tools among many professionals, the company’s flagship kit, the MultiMaster FMM 250Q Top, costs nearly $400—a price many remodelers and most DIY’ers cannot justify. 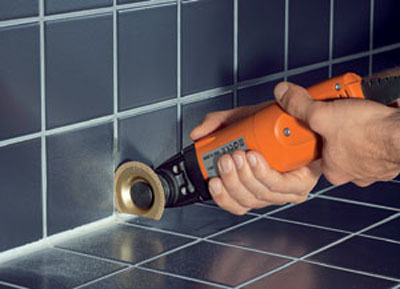 You do, however, get what you pay for, as the Fein unit has rock-solid construction, low vibration, a high-powered 250-watt motor, a quick-change blade system (nice! ), as well as other bells and whistles that qualify it as a standout among the competition. Still, that high price is often simply cost-prohibitive, compounded by the fact that Fein’s accessory blades cost a whopping $20 or more a pop. Compare those prices to the new Rockwell SoniCrafter ($150), the Dremel Multi-Max ($120), Bosch Multi-X ($160) or the Ridgid JobMax ($100). For the penny-pincher, you can even find the Genesis GMT15A Multifunction Oscillating Tool at Amazon.com for about $40. However, those prices, as it seems is the case with most of the latest multitools, are contingent on the contents of the kit. Most major manufacturers offer a streamlined kit that includes a multitool with only a few basic blades at an introductory price, while offering alternative packages that include more accessory blades and are priced accordingly. The functionality of the tools lies in the type of accessory being used. Available are sanding pads in a variety of grits, scraper blades for removing tile adhesive, flush-cut blades that eliminate the need to purchase a dedicated jamb saw … and many, many more. The back-and-forth action of the multitools can reach speeds of 21,000 oscillations per minute. The EHT staff has kicked around the SoniCrafter for more than a year, and we love its 10-foot corded reliability, powerful 2.3-amp motor and reasonable affordability. We’ve used it for sanding, rust removal, under-cutting door jambs and cutting notches in trim—just to name a couple of chores off the top of my head. It’s a lightweight tool with durable magnesium housing and a comfortable grip. Right now there are four different kits available. 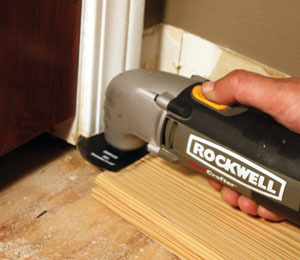 Note that the least expensive (22-piece) kit does not feature the variable speed functionality of the other Rockwell models. The kits include a canvas carrying bag and a storage box for the accessories. Rockwell’s reliable SoniCrafter multitool is available as a 72-piece kit chock-full of accessories for about $170. 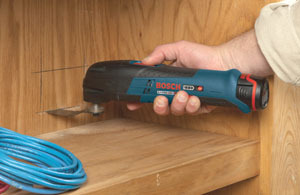 The 12V Bosch Multi-X includes two lithium-ion batteries for cordless portability. The cordless Bosch PS50 Multi-X has made several jobs easier over the past year. Regular readers may have seen this 12-volt lithium-ion multitool pop up in some recent stories where I’ve used its jab-saw attachment to notch a countertop, and used the same blade to notch out some door casings to install transition molding for a floor. In the past I’ve used a hammer and chisel for such operations, and it took me a heck of a lot longer to accomplish the same cuts. Although each multitool allows the user to adjust the angle of the blade, the Multi-X takes the cake with a tool holder that offers 240-degree angle adjustment for optimized tool movement. 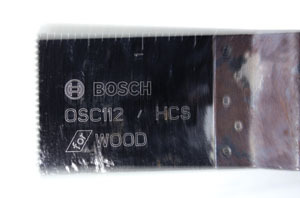 The new OIS accessory system from Bosch features an adapter ring to ensure the new accessories work on all the oscillating tools on the market. 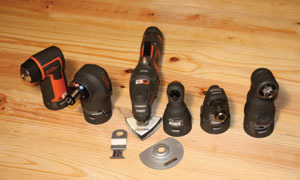 Comparing cordless tools to corded power is a bit like comparing apples and oranges. There are some inevitable trade-offs. For example, batteries—even the best ones—have a limited runtime. And a battery-powered multitool probably won’t deliver quite the power of some corded models. However, with batteries you get unlimited portability without the hassle of a cord tangling everything else on the jobsite, and you have the ability to work in remote areas without a power supply. Where the Multi-X excels is in ease of use during targeted cutting jobs, such as carpentry, caulk removal, plumbing and drywall cutouts. 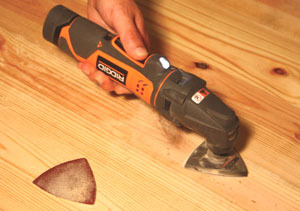 Jobs that require long spans of uninterrupted runtime, such as large sanding jobs, seem to drink up the battery power. There is, however, a backup battery included with each kit, quick 30-minute recharge time, as well as a battery fuel gauge on the tool that indicates how much juice is left. Also included is a charger, carrying case and a variety of accessories. The latest news on the Bosch front comes with the introduction of its Oscillating Interface System (OIS), becoming the first company to develop a standard accessory interface for oscillating tools. The system uses the OIS adapter ring to ensure the OIS accessories work on all oscillating multitools on the market—Rockwell, Ridgid, you-name-it—regardless of interface, and it’s designed to provide the best fit for all the tools. 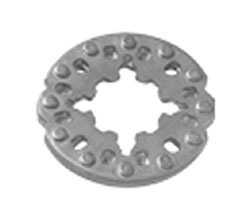 Other adapters employ a pressure-fit solution instead of an actual interconnecting fit for the multiple interfaces available, which sacrifices blade performance. The Ridgid JobMax oscillating tool features a removal head for an interchangeable body that connects to different tool heads. 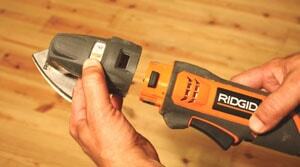 The new JobMax system from Ridgid shows a complete rethinking of the multitool concept. Using a 12-volt lithium-ion powered power takeoff (PTO), the JobMax is much more than an oscillating tool. By utilizing five interchangeable heads that connect to the PTO, the JobMax is also a 3/8-inch drill/driver, right-angle impact driver, 3/8-inch square-drive ratchet and an auto-hammer. The durable base includes an LED work light and a variable-speed, paddle-style trigger. The base easily quick-connects to each tool head with a couple of side buttons. The heads interface with the PTO in 4 different positions, which allows the user to position the trigger facing forward, backward or offset to the side. The JobMax heads also connect to the base in four different positions so you can adjust the trigger location to your preference. I had my doubts about an all-in-one multitool performing as well as its individual dedicated competitors. But after running it through the gauntlet, I was impressed that the JobMax was comparable to other 12-volt tools, including the Craftsman AutoHammer and Bosch Multi-X. As with everything, there’s a trade-off such as the limited runtime of a cordless tool, but also of note is that, depending on which Ridgid tool head was attached, the JobMax did weigh more than the competition—more than twice the weight of the Craftsman AutoHammer—which may play into user fatigue during lengthy work times. Regardless, I think the JobMax is an excellent multifunctional system. With the separately sold accessory heads, the JobMax can be configured as a drill/driver, right-angle impact driver, square-drive ratchet or an auto-hammer. 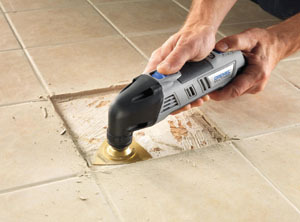 The Dremel Multi-Max is available in both a corded and cordless version. The cordless version is powered by a 12-volt Max lithium-ion battery and is designed to match the performance of the 120-volt corded model’s ample 1.5-amp motor at all speeds. Both models feature variable speed up to 21,000 oscillations per minute and have electronic feedback circuitry that keeps the blade at a consistent speed during tough applications. A separate on/off switch includes a soft-start feature that makes activating the tool easier and more precise when starting with the blade against a work piece. The Dremel Multi-Max features a quick-change accessory interface and electronic feedback circuitry that keeps the blade at a consistent speed during tough applications.